I finally found my second swimsuit of the season through the suggestion of Reiko from God's Favorite Shoes. She was looking for a retro swimsuit and told me that she got hers from Wal-Mart. I decided to pick up one as well. I am always looking for ways to spruce up my one pieces since they can plain and boring. The linen blazer was a great way to to stylishly cover up up your swimsuit. Linen is a great summer fabric and I have thrown it over just about everything. And don't worry about how easily linen wrinkles...to me adds to the charm of the fabric. This blazer has probably been my most favorite and most worn items of the summer. I had the it taken in a bit on the sides to try to give it a little more shape, but overall it looks great with just about anything. 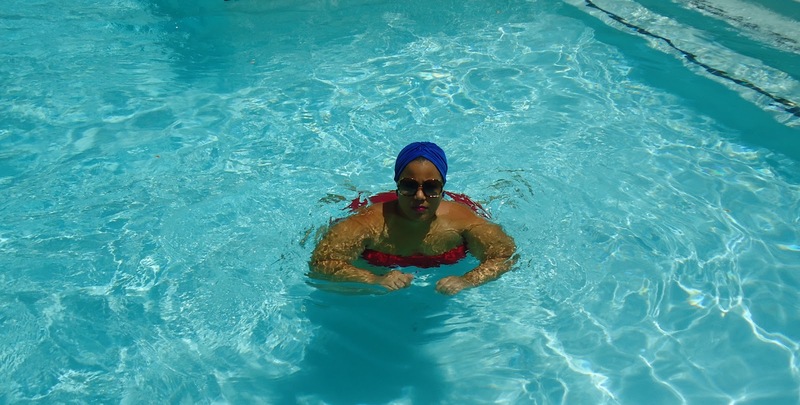 The turban is a great substitute for the swim cap, but I wouldn't swim in it. It does give a sophisticated look and it can stylishly cover up any bad hair days. On this particular swimsuit you have the option of tucking the straps and making it strapless. For bust challenged ladies like myself, the straps can actually add a little extra boobage...LOL. Another plus of the swimsuit was that the rushing skirt portion was only in the front. When you are hippy attached swimsuit skirt tend to ride up, this particular couldn't ride up because of the design. Now one might ask, "do you really wear all those clothes when you go swimming?" Sadly, I do...ask my nieces and nephews. We went to the beach recently. I am a woman that loves to go overboard...LOL. Anyways, did anyone else have any great swimwear accessory finds this season? I actually purchased the same swimsuit from Walmart, only in the color black. Never did I think about tucking the straps in, it's an awesome idea! Adding the turban & blazer is genius! I normally just wear a tunic over it but you can't see the beauty of the swimsuit that way. I love your suit. It looks like an editorial. So fabulous. You look so great in this suit...and the color is beautiful! Very nice pics. Those shades are hot. Love the color of that suit. That turban adds an extra chicness to the look. Fabo! Those shades are so sick!!!! you go girl.. I would have never thought to wear a blazer over my bathing suit hut it looks so chic with the turban! I feel like running to the beach this instant! I love that RED! You are so diva in your turban. I am stealing that concept next time I am curbside. Hi Chastity, So cute, i bought this swimsuit on June and it feets really great! You look so lovely in that suit,,really flatters your shape..absolutely gorgeous!!! 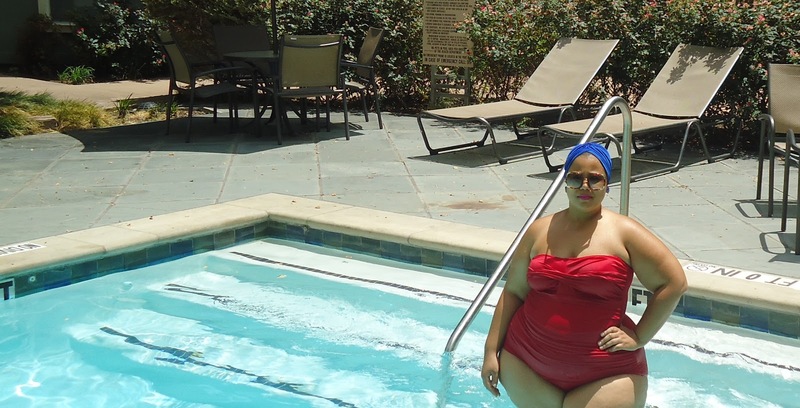 I ended up taking my swimsuit back because I ordered a size too big. I found another one at TJ MAXX that was very similar. I love the chic touches...the headwrap...the jacket. CHIC! Love the turbin too. Where did you get it? They have some beautiful cover ups at AlwaysForMe.com too.